Chunlei Guo is a professor in The Institute of Optics at University of Rochester. His research is in the area of femtosecond laser-matter interactions at high intensities. 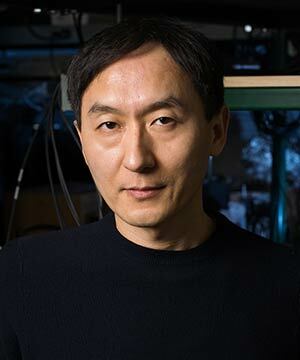 He received his Ph.D. in Physics from University of Connecticut in 1999, and was later named one of the University's 40 Under 40 Outstanding Alumni. His postdoctoral training was at Los Alamos National Laboratory, where his work was awarded the Postdoctoral Publication Prize in Experimental Sciences. He joined the faculty of University of Rochester in 2001. His research at Rochester led to the discoveries of a range of highly functionalized surfaces, such as the black and colored metals, and superhydrophilic and superhydrophobic surfaces, which promise technological applications and have been covered extensively by the media (read more). He is an elected Fellow for American Physical Society and Optical Society of America. Professor Guo's general research interest is in studying femtosecond laser interacting with matter, including gas, solid, and plasma phases. In gas phase, the research focuses on understanding multielectron effects of atoms and molecules in strong laser fields; for solid materials, we study functionalizing material surfaces through laser engineering. The research in this direction led to the discoveries of a range of highly functionalized surfaces, such as the black and colored metals, and superhydrophilic and superhydrophobic surfaces, which promise technological applications and have been covered extensively by the media (read more).